All the Mods started out as a private pack for just a few friends of mine that turned into something others wanted to play! Can you get to the Creative items by making the "ATM Star"? 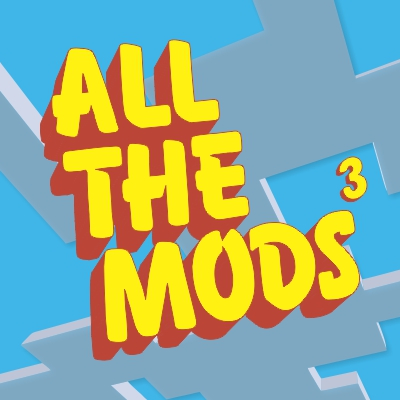 In All the Mods 3 we will continue the tradition adding many new mods while going for more stability. That issue where the client crashes when you insert objects into a compacting drawer still exists. Will that be fixed in ATM3? I don't want to go to ATM3:Remix yet because it's too buggy right now. That is an issue from minecolonies, and when the pack updates that mod will be one of the updated mods as well. That should fix the issue. Thanks for this awesome modpack! I just wanted to ask if you plan on updating to 1.13? And if so, do you have a rough time estimate? I hope I'm not annoying you with this, I just couldnt find any newer info and I absolutely love this modpack and would love to play it with the new oceans! There are plans for 1.13 and 1.14 in the mix, but nothing is set yet. Part of it is waiting for mods to be updated for those minecraft versions, that and one or two other things. May I ask what the one or two other things are? Can't figure lut if the mob spawn overlay is in this monster of a pack. Any help? I don't believe so but you can use the dependencies link above to see the curse links to all the mods in the pack. How do I put more RAM in the minecraft server, obviously the server with mods. please use the help desk link above for this topic as there are links to walk throughs and players with server experience that can help. Would you be able to make a full release for the current version, so we can download it please? Twitch is severely bugged, and is not letting me download or install any modpacks, and, the latest full pack release was a few months ago. I would like to play this pack. Please use the help desk link above as we will be able to walk you through the process of getting the pack for use with other clients. We have a great community that may know the answer to this question on discord. You to can get there by following the help desk link above. I don't know the answer but someone in the community should. Does this modpack have quests yet? Just curious. ATM3 and ATM3 remix do not have quests. You can use the "L" key for achievements to see the achievements of the various mods. ATM3 is in maintenance mod and will not have any major updates done to it. ATM3 Remix is the active pack for updates and changes. Oh, all right. I played All the Mods 3 last year and was told that it would be getting quests soon. Why is the modpack in maintenance mode, and how long is it going to be? Just curious. Yes, there was plans to add quests to ATM3, but as they got into it and mod changes they realized it would break worlds. So they decided to put ATM3 in maintenance mod and move updates and future plans to ATM3 remix.